Not much is known about the Fry Genius. All we have are bits and pieces of evidence... sometimes found alongside a trace of Ketchup. The complete wisdom of the Fry Genius is indicated by his choice of Crinkle Cut fries. 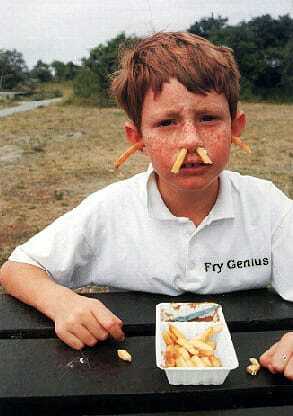 After all, who could call himself a Genius and be caught eating Fries of any less stature. So as you finish out the day, remember the Fry Genius and hope and pray that one day, you too will be able to walk in his footsteps of potato prowess.